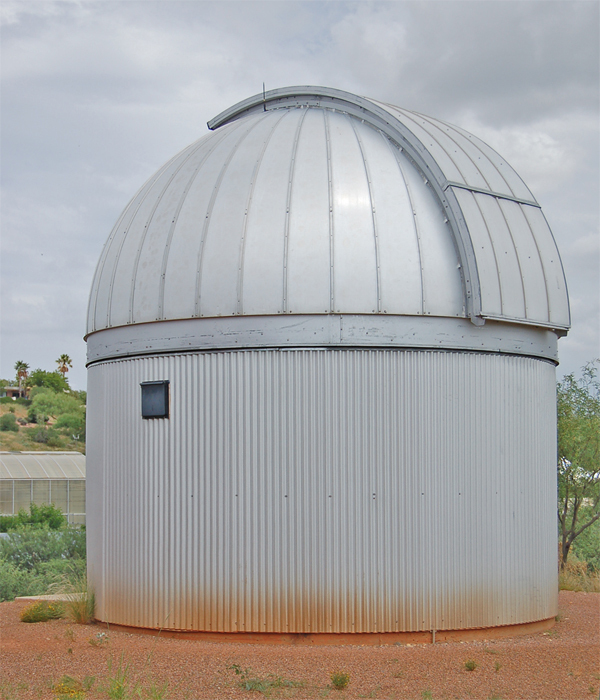 Refer to our Site Index page for an overview of the Observatory. The MCCM Observatory complex is based upon an Optical Guidance Systems (OGS) Ritchey-Chrétien professional grade computer controlled telescope and it is provided complete with a professional aluminum Observatory dome with welded steel cylindrical foundation structure. 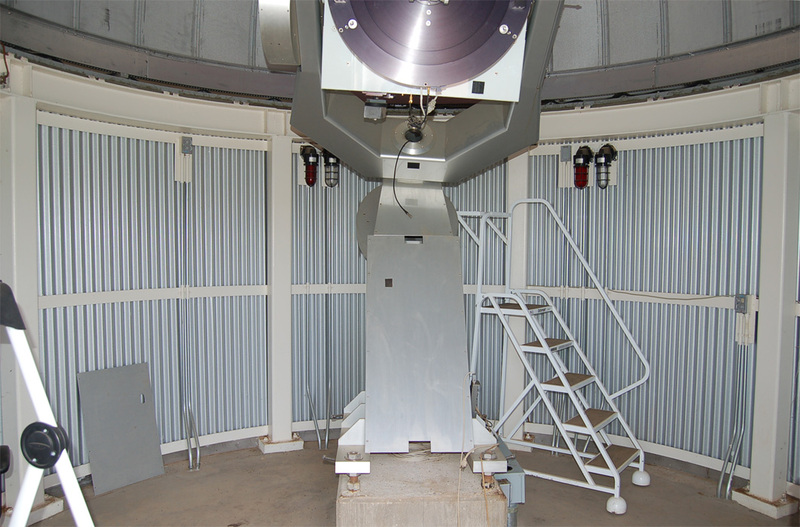 The telescope can be stored safe, ready for use and properly aligned for rapid activation. Protection for the telescope and operators within from wind. Domes in particular are among the best structures at resisting storms and winds; the dome installed at the highest elevation known to us is in fact an Ash Dome installed on the 17,500 foot (5,334 meters) high Mount Chacultaya in Bolivia and operated by CalTech and the USGS. 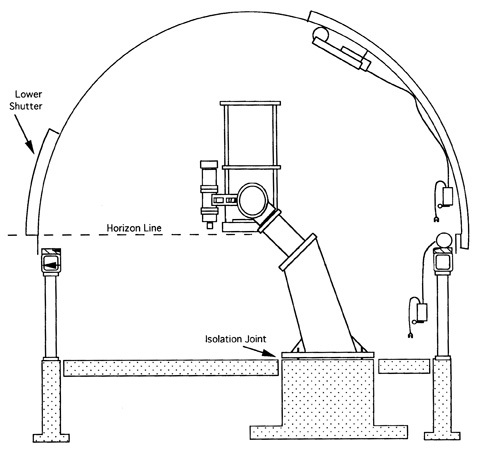 Protection for the telescope and operators within from dew. Telescopes can usually be operated without a Dew Shield and not fog or freeze. Provides shielding for the telescope and operators within from local lighting. This helps the visual astronomer's eyes to dilate fully thereby allowing views of fainter objects. The one drawback of this is that one only sees that portion of the sky visible through the open Shutter area. A Dome can be added onto or alongside a new or existing structure and blend in as an architectural feature with choice of color and metal (copper, aluminum, etc. ), all while maintaining a compact footprint. Unlike other devices including a sliding roof assembly for example. Finally: IT LOOKS LIKE AN OBSERVATORY SHOULD! The presence of a Dome to most people is the tangible proof of an astronomical observatory. 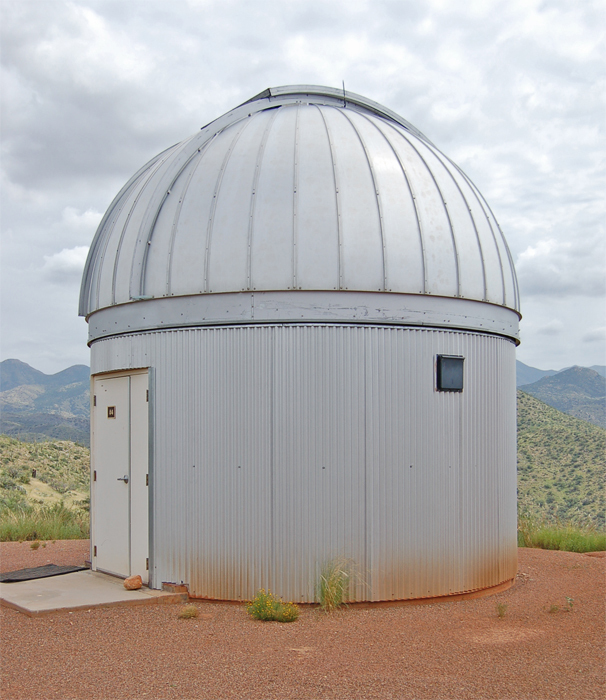 In some instances a community or a college will insist on the provision of a Dome for a new observatory out of pride even when alternative structures (some at less cost) may be adequate. 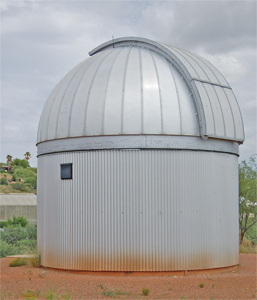 Table Above: Observatory and telescope as it appeared while at the Biosphere 2 complex in Arizona. Click on each image to see the enlarged view. Fork Mounted telescope. This necessiates an off-axis Pier with isolated foundation. 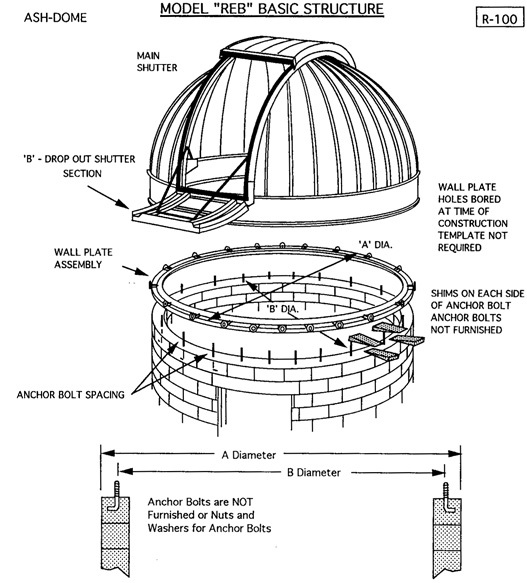 Ash Dome Manufacturing Catalog Complete 16 page color illustrated catalog of these domes with fantastic illustrations of how some individuals and universities have incorporated these domes in artistic ways. By Ash Manufacturing, (6,012,361 bytes in Acrobat Reader ".pdf" format). Click here to download the software free from Adobe's web site.